3.8 out of 5 based on 14 bloggers and 10 commenters. 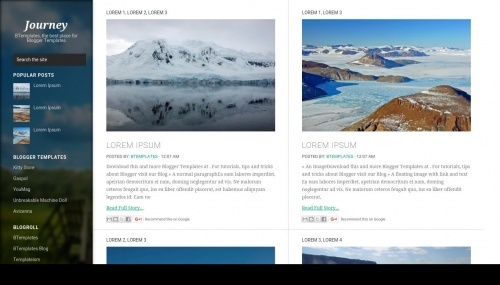 Journey is a free premium blogger template with 2 columns, responsive design, magazine-styled, left sidebar, gallery-styled, fresh look, an exclusive design for Blogger, posts thumbnails, breadcrumbs, pagination, related posts support, well designed threaded comments and pinterest style. Excellent template for blogs about any general topic, business, to write a diary, nature, news, photography or a personal portfolio site. very nice template. i must use it in future.. I really like this template, but I can’t get the first post image to appear on the home page. Hi Melissa, is the image the first element in your post? How can i change the side menu bar width? I used a custome searchbar because the original not working. But that one is wider than the sidebar. I need more width but i cant find that part in html codes. How do I control the image size? Right now all the images come out big. How can I make the template work with the blogger small, medium, large size. Sorry for the prior question but I know how to fix it by myself thanks. But I still got a problem. How to adjust the size of image? because whenever it appears on blog, it’s always in huge size even it is not suited with pixels. Can you help me about this one? Thanks.